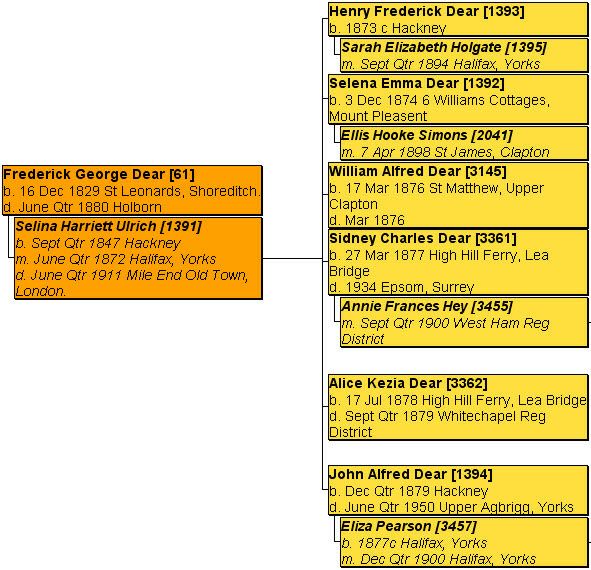 Researching the origins of my ancestors, the Dear family, is ‘Work in Progress’ - a tag that can be applied to all family history investigations. But in this instance, I believe that there is more to be discovered, for a certainty. The family has been traced back to the clustered streets around Aldergate and Cheapside, near St Paul’s Cathedral in London. In view of the details which have already been uncovered, I am confident that there is more to be found about the Dears. For some reason, after seven years, John did not receive his Freedom following his apprenticeship. This was granted in 1803. The Goldsmiths’ librarian, David Beasley, sent me this e-mail: ‘I can confirm that the apprenticeship record of John Dare is exactly that spelling and signature and that by his Freedom date (6 April 1803) he had become John Dear. There is a marginal note in the Freedom Book to this effect - “see appr(entice) book 5 May 1790: he signs Dare”’. So, with the benefit of these details, what follows is the earliest known history of the Dare/Dear family. We know where he lived - Jewin Street * - and his trade - carpenter. Jewin Street was so named as it was an ancient burial place of Jews. It lay in the labyrinth of streets between St Paul’s Cathedral (to the south) and the Barbican and straddled the two parishes of St Giles Cripplegate and St Botolph without Aldersgate. Much of the street was destroyed by a great blaze in 1897 when it comprised of mainly large, six storey business houses. The process of devastation was completed by the blitz of 1941 after which Jewin Street was no more. In view of his trade and as his son was literate (a pre-requisite of an apprenticeship), one may infer that John was also educated. It is worth noting that a John Dare (son of William and Sarah) was baptised on 12 March 1753 at St Vedast, Foster Lane and St Michael Le Querne. This parish is about half a mile south-east of Jewin Street, close to St Paul’s. Perhaps, this record relates to my ancestor, John Dare, and should be investigated further. The date of John Dare’s birth may be roughly calculated from the start of his apprenticeship - May 1790. John was probably about fourteen years old at the time and so was born in around 1776. Unfortunately, I can find no local corresponding entry in the parish records, so the date of John’s baptism cannot be established. 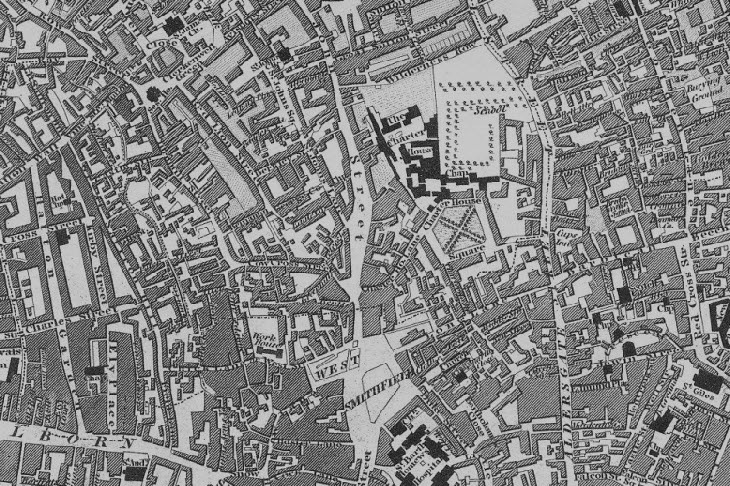 On 5 May 1790, John began an apprenticeship with John Whittingham, an engraver of 13 Staining Street *, Wood Street which was less than a mile south-east of Jewin Street - a fifteen- minute walk from home and 250 metres north-east of St Pauls Cathedral, close by Goldsmiths’ Hall in Foster Lane. We can deduce much about John from his chosen profession. The art of engraving involves cutting away metal with a tool that produces a fine, vee cut. The lines vary in depth and width and the resulting decoration has a crisp quality that catches the light. It is a demanding and skillful craft that has much in common with fine ink drawing - in fact, the successful engraver must have the ability to draw. Parish records and trade directories indicate John did not stray more than a square mile during his less than fifty years. He was living at Jewin Street in 1790; he married at St Giles without Cripplegate in 1801; from 1802, his children were baptised at St James Clerkenwell (he was living at Wilderness Row for at least ten years until 1820) and when he died in 1824, he was living at Charles Street, Holborn, being buried at nearby St Andrew’s, Holborn. 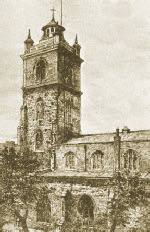 All except Frederick John (bapt St Giles without Cripplegate) were baptised at St James’ Clerkenwell - however, the infants who died were buried at St John the Baptist Clerkenwell. From at least 1811 until around 1820, John was living at, and trading as an engraver and piercer from, Wilderness Row (No. 5 in 1811; No 23 in 1819. His home looked out onto the grounds of Charterhouse School. Mary was buried on 26 March 1820 at St John the Baptist, Clerkenwell (where her three infant children lay). John then moved to Charles Street in Holborn (when Matilda died in 1822, she was living at Holborn - perhaps living with one of his children) until he died and was buried on 30 May 1824 at St Andrew’s, Holborn. Amelia Mary Dear married Samuel Orm on 18 March 1837 at St John’s, Hoxton. In 1841, he was a pearl worker at Castle Street, Holborn, and ten years later he was a wholesale goldsmith at 5 Castle Street. He evidently exhibited at the 1851 Great Exhibition. The couple had three children. C51, lodging at 81 Herbert Street, Hoxton - jewellers foreman; C61, lodging at 13 Rushton St - jeweller; C71, at 113 Grays Inn Road, St Pancras - jeweller and C81 lodging at 6 Victoria Road, Islington - jeweller. In 1841, they were living at Ivy Street, Hoxton Old Town and Henry was a silversmith - indeed, he remained a silversmith throughout his life. However, Eliza died in November 1842 following the birth of their second child, Eliza Mary (non-conformist burial - the family then lived at Union Square). Eliza snr was buried at St John’s, Hoxton on 27 November 1942. Henry then lodged with his relatives until his death in 1891. Then, in 1881, Henry was living with William and Eliza (nee Osbourne, father Thomas Samuel) Edwards, ‘cousin’, at 64 Dumont St, Stoke Newington. Ten years later, in 1891, he was lodging with Edwin Osbourne (47 and son of Thomas and Ann) and his wife Rosa (nee Edwards, daughter of William and Eliza) at 49 Sparsholt Road Islington. There is a possibility that John and Mary Dear had another daughter. Caroline Dear was born at Clerkenwell in around 1809 - but I can find no reference to her baptism. She married Daniel Edwards on 23 July 1826 at St Giles without Cripplegate. Concerning Frederick John Dear, data has been disgorged in a satisfying torrent. He was baptised on 13 March 1804 at St Giles, Cripplegate. Although he was silversmith with his own mark, I have not found any details of his apprenticeship. He married Emma Brown, the daughter of a builder and lessee of property and taverns, on 21 December 1828 at Hampstead - Emma was just fifteen years old! Their first child was born a year later. The couple had a total of six children. It was while Frederick was living at 3 Kings Square that he succombed to phthisis pulmonalis (TB) on 27 December 1844. He was thirty-nine years old and left behind a thirty-one-year-old widow and four children aged ten or under.The task of informing the registrar of his father’s death fell to my greatx2 grandfather, William, who was fourteen. Bereft of her breadwinner, how could Emma support her family? Six month’s after her husband’s demise, Emma began trading as a silversmith in her own right. On 20 July 1845, she joined forces with Henry Dear (probably her brother-in-law) in a business that operated from 48 (Great) James Street, Hoxton. 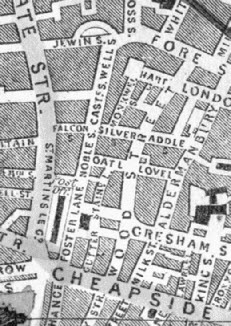 Then, she moved to trade from 4 St James’ Walk , Clerkenwell and registered her own silvermark. So, was Emma herself a silversmith ? It was not unknown for ladies to learn the craft, but the view of the Goldsmith’s librarian is that she probably ran the business rather than getting her hands dirty - literally so, as silversmith’s hands became very stained. 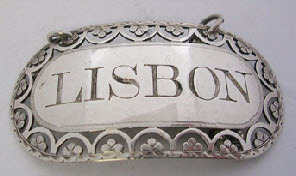 Indeed, in the censuses between 1841 and 1861, Emma was not described as a silversmith. 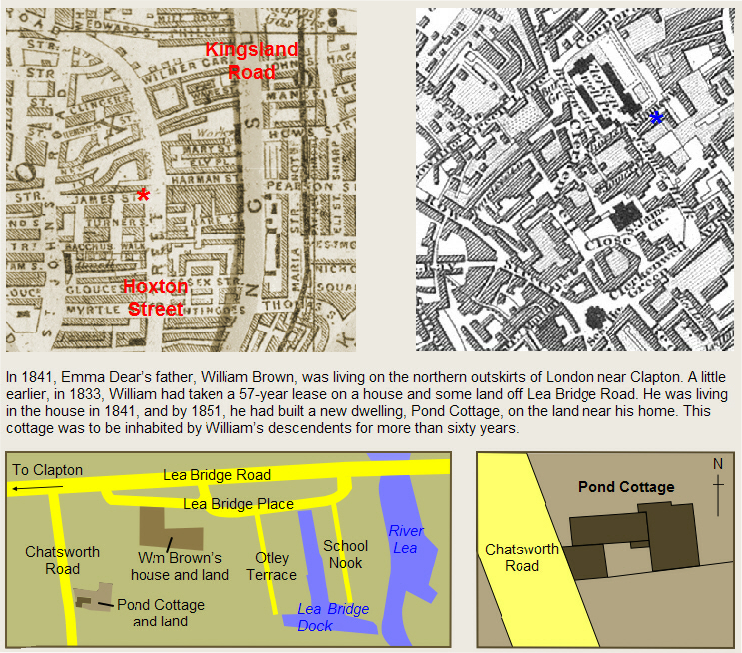 It is perhaps not surprising that two other branches of my family were in the Clapton/Lea Bridge area during the latter half of the nineteenth century. The Greens lived beside the River Lea from the 1840s and the Dees were at Stoke Newington and Clapton - William John Dee had a shop near the corner of Lea Bridge Road and Upper Clapton Road. Emma’s situation improved following the death of her father in August 1849. By the terms of his will, she received a bequest of £20, two silver tablespoons and four teaspoons and the ‘leasehold tavern’, The Duke of Cambridge, Cambridge Heath, Bethnal Green was placed in trust for her. 1851 found her living at Pond Cottage with all her children - she was described as a ‘house proprietoress’. Emma remained at that home until her death on 7 April 1866. After an inquest, the coroner noted the cause of her death as a sudden rupture of the aorta. Emma was fifty-two. Frederick George Dear (1829 - 1880) There is mystery swirling around Frederick. In the 1861 census, he said he was a widower and he is shown thus on his marriage certificate. However, no marriage can be found. He also claimed in 1871 to have been born in Sussex together with two siblings. This was patently untrue. Frederick was a silversmith - specifically, a silver plate polisher - and from around 1878, an electro-plater. For most, if not all, his first forty years, he lived with his family at Pond Cottage, Clapton. Then in the spring of 1872, he married Selina Harriett Ullrich at Halifax, Yorkshire. The couple settled at High Hill Ferry, Stamford Hill near the River Lea (where Selina had grown up) and quickly produced six children between 1873 and 1879 - though two died in infancy. Then, in 1880, Frederick (64) died leaving Selina, aged 33, with four young children. She paid the bills as a char woman at 6 William Cottages, Little Hill, Stamford Bridge and two of her children were cared for by relatives - Selina Emma, by my great grandparents William Sidney and Anne Dear (1881-1891) (William was a witness at her marriage) and Sidney Charles, by Thomas and Emma (nee Dear) Ellis (his aunt) in 1891. In the spring of 1890, Selina married the general labourer, Irwin Robinson at Halifax and in 1891, they were living with Selina’s children, Henry and John at Rastrick, Yorkshire. The couple had a daughter, Edith Evelyn Robinson who was born on 29 July 1891 at Little Woodhouse, Rastrick. Selina then moved back to London and in 1901 she was living at 6 St James Road, West Ham, Essex. Irwin died in January 1903 at Huddersfield and Selina, in 1911 at Mile End Old Town, London. 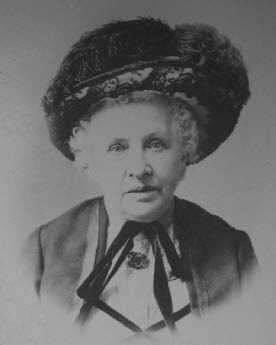 Emma Amelia Dear (1834 - 1898) was another who lived at Pond Cottage until she married relatively late in life - in 1878 to Thomas James Ellis. However, there are some odd facts that surround her that I will lay out without drawing any conclusions: in the census of 1861, Emma is a visitor (aged 27) at John Bruce’s home, Hackney (35), b London (widower and goldsmith) who has three children: Alice 6, Arthur 3, and John. On 16 August 1864, John Mackenzie Bruce, goldsmith, married Ellen Diamond at St Peter’s, West Hackney. Then, in the census of 1871, John Bruce (45), is recorded as living at 2 Belgrave Terrace, Hackney (nr Oldfield Road), a goldsmith’s apprentice with Ellen, his wife, Emma E (!) 14, daughter, b Islington and John H 4, b Upper Clapton. Now married, in 1881, Emma and Thomas (a cow keeper) were living at Dairy Cottage, Lea Bridge Road with a visitor, Sidney Dear (3) - her nephew. Ten years later, the couple were at 41 Melford Road, West Ham (Thomas was a dairyman) with Sidney Walter H Dear. Thomas died in 1892 and Emma, in 1898. 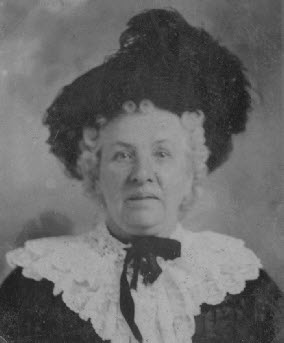 Matilda Dear ‘Tilly’ or ‘Aunt Em’ (1836 - 1916). Much of Matilda’s life has been discussed in the article about her brother William Sidney Dear. Link: Matilda Dear. Matilda also lived at Pond Cottage until her marriage to Charles Mayston on 13 September 1873 at St Peter’s, West Hackney. Charles' parents were Robert Mayston (a farmer) and Mary Goldstone who married 11 May 1813 at St George Hanover Square, London. Charles was born on 10 March 1817 and baptised 2 April 1817 at St Mary the Virgin, Aldermanbury. The couple lived at 11 Rushmore Road (south-west of the junction of Lea Bridge Road and Upper Clapton Road) all their married lives. They had a son, Charles Ranger Mayston, who was born on 6 March 1875 and died on 25 August 1905 when he was living at 5 Clapton Square, Clapton. He died intestate and his effects of £200 were administered by the widow, Emma Rebecca Mayston. £3,448 3s 4d. Matilda had moved 170 Brooke Road, Clapton by 1901, where she had a servant. She was a guest at the wedding of Gertie Dee and Harold Saunders in 1911, when she bought a gift of a silver cruet. She was also present at the wedding of my grand parents in 1909 and is included in the wedding photograph. When she died and was also buried at Abney Park, she was living at 185 Lower Clapton Road. Her effects amounted to £1,053 0s 8d. Alfred Samuel Dear (1841 - 1912) lived at Pond Cottage most of his life.He was a pig dealer in 1861 and then a dairyman/cow keeper. He married Agnes Baker on 22 March 1876 at St John’s, Hackney. The couple had six children only three of whom survived. By 1911, the family were living in a five-roomed house at 33 Millicent, Road, Leyton. Alfred had retired, but his daughter, Margaret may well have taken over as Manageress of the dairy business. 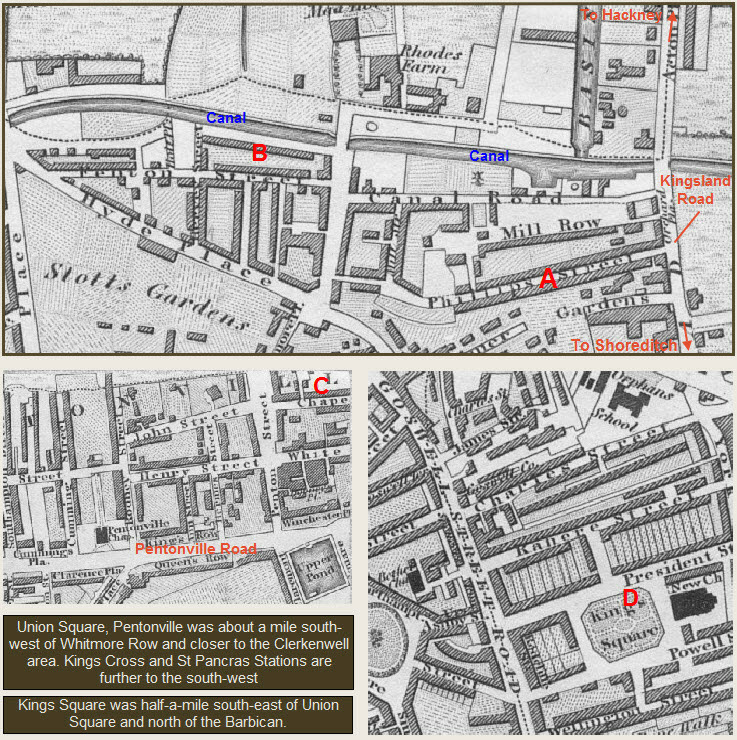 Maps of London reproduced with the kind permission of Mark Annand. The Greenwood map of London (1827) can be found at this Link: Greenwoods map of London. Henry William Dear married Eliza Brooks on 18 March 1839 at St John’s Shoreditch. They had two children.